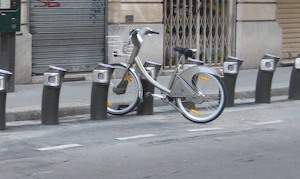 Michael and I were in Paris in July, just a few days after the launch of the Velib’ scheme (Vélo Liberation) – which provided bicycles for public rental at hundreds of ‘stations’ around the capital. We didn’t get a chance to try one, though I’ve used a similar facility in Copenhagen before. The Paris scheme works partly because it was funded and managed by JCDecaux in exchange for control of large amounts of advertising space, and partly because users need to provide a credit card-based €150 deposit to be able to hire one. Anyway, apparently it’s been a huge success, with 10,000 bikes deployed and people using them for 100,000 journeys per day. Ken Livingston, are you listening? There’s more about the scheme here and here, and many other successful operations are running in other cities around Europe. Ten years ago in Cambridge, of course, we had the Green Bike Scheme, which has passed into local legend – almost into mythology, because even if you lived in the city at the time you might have missed it. 300 unclaimed bicycles from the police pound were painted green and deposited at special stands around the town with the idea that people would just pick them up at one place and drop them off at another. Well, they got the first half right. All of them were stolen within the first day or two. I lived in the centre of Cambridge at the time and never even saw a Green Bike, let alone rode one. The special stands were quietly removed a little while later.